My first trip out on a commercial boat, the Anna B, played out the way I’d learn it often does for salmon trollers. After months of preparation at the dock, sanding, painting, and making gear, the opening day of salmon season looms just around the corner. For a week, you’ve been negotiating a price for your fish, along with a bunch of other vessels, and hoping none of the others decide to go out on strike. At some point during the final 48 hours [weather permitting], you jockey for position at the crowded fuel dock to gas up and blow ice into the hold. The chaos is like a shopping mall the day before Christmas. There’s one last chance to raid the grocery store before throwing the lines. You head out a couple hours either side of midnight [weather permitting] to get to the fishing grounds by dawn. Buddy boats team up and do their radio checks using this year’s secret codes. You leave the jaws of the harbor on your way to filling your hold with fish (you hope). At first light [weather permitting], you send the gear into the depths, cross your fingers, and say a prayer or two. As the day unfolds, your prayers are answered. You couldn’t have asked for better weather or a calmer ocean. The Anna B went on to land 73 salmon that first day (actually, 73½ if you count the front half of a 20-pounder that got bit cleanly though by a white shark while it was on the line). Over the next four days we filled the hold and turned the boat back to port. By the end of that trip, I was hooked as well! 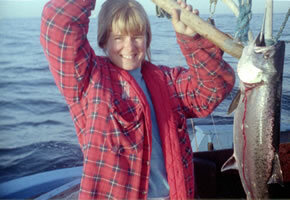 In the years that followed, I fished on many different boats for a variety of species. My travels took me from California to Washington, and then on to Alaska and Hawaii. 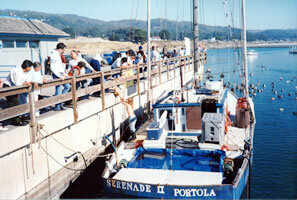 I sportfished whenever I got the chance, and even served as deckhand on some party boats occasionally. Yet I’ll never forget the good old days, fishing in front of the bait receiver at the Pavilion, spending weekends at Catalina Island, or running out of gas in the Glasspar and getting towed back to port from Huntington Flats. If you’ve had a successful day at sea, I will only remind you of two things: clean it and ice it as soon as possible! I like to use a wooden cutting board to fillet or to steak fish. If they’re big fish, I use a sheet of plywood. Try not to soak the fish with water while you are cleaning it. Rinse it lightly, or just wipe off small bits of shmutz with your fingers or paper towel. Then, put it in plastic bags and lay it out on ice. Don’t dump a lot of heavy ice on top of your beautiful fish! When I’m done, I rinse the board off with cold water first and then spray it with a bleach and water solution. I follow that with a good soap and hot water washing. I also use the same bleach solution to spray out the ice chest I used to carry the fish home. It’s what works best at getting the fish smell out. For the rest of you who are stalking your prey through the glass (at the market), pay attention. Your best bet is to buy fish locally when in season, right off the boat when possible. You will not only get a fresh fish, but an education to go with it. Most fishermen love to tell people about their boats and catch. Just try to avoid the topics of politics or fishing regulations, and you should do ok! Your best bet for a year-round supply, especially when looking for exotics, will be an upscale market or seafood store. Depending on where you live, some seafood restaurants will also sell fish to their customers. Try to shop for fresh fish close to the weekend, as that is when most suppliers deliver the new orders. Do not buy fish that looks dry or off-colored. The smell shouldn’t be overpowering either. Prime flatfish are often displayed belly-up to show off the condition of the fish. If you wish to purchase one displayed eyes-side-up, be sure to first flip it over to check for bruising. I often take along a small cooler with blue ice when I go shopping, in case I happen to run across something good. This also comes in handy for cheese and ice cream, if you live in the boonies, like I do. When you do find a nice supply of fish at a good price, you may wish to buy some extra and to freeze it for future use. This works out especially well with whole fish, such as salmon or large halibut. I will often steak the front half of the fish and fillet the back. I use two methods of packaging. For short term freezing, I like to use a freezer quality airtight Ziploc bag, and I remove as much air from the bag as possible before sealing it. If I’m storing fish in the deep freeze for a while, I vacuum seal it. An affordable vacuum packer, such as FoodSaver, can be found in stores or over the internet and is a good idea if you get into cooking or catching a lot of fish. Whatever I’ve chosen for a recipe is, in my opinion, the best possible fish for that particular recipe; that is, of all the species I’ve tasted so far. In most cases, I have added suggestions for alternative fish substitutions. If you want to try an alternative species, try to get it in the same form. That is, if a recipe calls for a halibut fillet, 2-3 inches thick, and you want to use Chilean seabass instead, just make sure to use a fillet that’s about 2-3 inches thick as well. For the health-conscious, the three fish highest in omega-3 fatty acid content in this book are Chilean seabass, salmon, and bluefin tuna. Leave the skin on your fish if it came that way, in case you choose to use a cooking method that requires it. You can always remove it later if it is not needed. Fresh fish should be stored in the refrigerator or left on ice for use within one to two days, for best flavor. If you notice liquid collecting around the fish during this time, drain it off and pat the fish dry with paper towel. If you like sashimi, I recommend the tuna species or yellowtail (hamachi). This is best when kept fresh on ice, especially while still on the boat. I have known people who keep wasabi in their tackle boxes! Most of the time, we engaged in “live” fisheries, which meant that you had to subdue a ling, sometimes up to 40 pounds, and wrestle a jig out of his mouth before throwing him in a tank. Every now and then, you’d go stir the tank so that some poor fish pinned in a corner could move and start using his gills again. As I mentioned, they’re hard to kill. 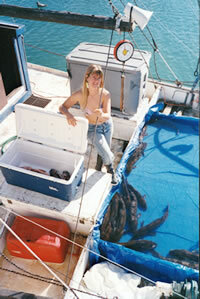 We could keep between 500 and 1800 pounds of fish alive to sell back at the dock. Excerpts taken from the introductory chapter (“Hooked on Fishing”), Cooking Basics (“Caught it vs. Bought it”), and the intro to the Lingcod chapter.